Vienna Secessionist design is one of the most alluring of the modern era. 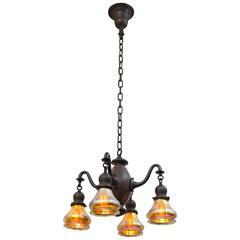 It captures the modernist movement as it secedes from the ornate Victorian era. It can look like Art Deco, or Art Nouveau to the onlooker. We don't get much of this great movement in the antique world, but we are constantly on the lookout for it. This chandelier has the look we like. Clean lines and simplicity of design are all present here. Having 5 hand blown Vaseline glass shades are nice fit for this light. Here's a chance to own a beautiful example of this modernist movement dating back to the early part of the 20th century. Check out the paintings of Gustav Klimt to see this design on canvas. Exquisite and excellent quality chandelier probably Venini or Barovier. Blown Murano glass with gold inclusions. Italy, circa 1949 Re wired. Very nice example of Vienna Secession - Jugendstil chandelier made of wonderfully designed highly gloss brass and six original handmade tulip shape glasses. 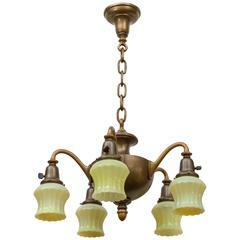 Remarkable Viennese secession brass chandelier with original pendant cut glass cups. Above the main bowl hang six smaller cups, on the brass edge are wreaths of bay leaf.